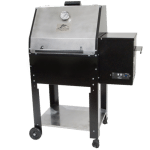 Prime Rib on a pellet grill is easy and awesome because of the consistent cooking temperature a pellet grill provides. Try this easy recipe. Score the fat side of the roast vertically and horizontally with a sharp knife. Generously apply rub to the entire roast 24 hours prior to cooking wrap in plastic and place in Refrigerator. Pre-Heat your grill to 375 degrees for 15 minutes prior to grilling. Remove from grill and wrap in a towel and place in a cooler. Let the roast stand for 15 minutes then slice and serve.